Ilona Kiss is a Swiss artist whose work includes drawing, painting and collage. Her work is mainly influenced by questions of place and belonging and is drawn to the ambiguity and the unfamiliar. A sense of adventure and the poetic quality of uncertain situations have left their mark and influence her work as such. The darker side of own and collective experiences are explored through subtle juxtapositions yet within more traditional genres like landscape and the romantic era. 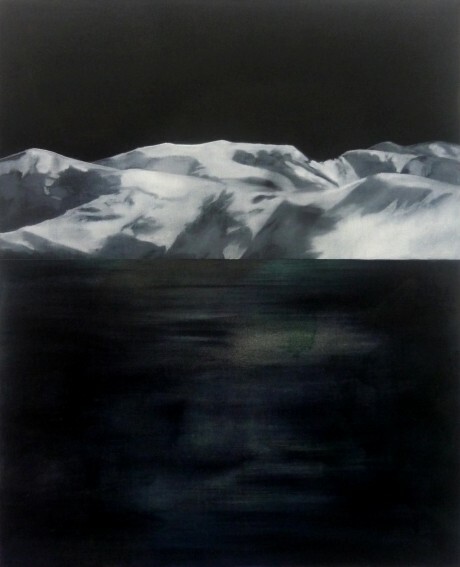 Darkness, loneliness and a sense of sadness surface through her work and let the viewer encounter beauty without prejudice but with integrity and sometimes through unsettling contrast. Exploring the tension between the human condition and the notion of tragedy, her seemingly quiet images are ambivalent and take time and place out of context. Her paintings and labour-intense charcoal drawings have the tendency to disorientate the viewer leaving questions unanswered. Ilona Kiss was born in Zürich, Switzerland in 1969. She studied at the Academy of Fine Arts in Vienna, Austria 1989-1993, Manchester Metropolitan University 2003-2005 and completed her MA in Fine Art at Manchester School of Art in 2013. She was working as a stage designer at leading theatres in Germany and Austria before moving to Manchester. Her work has been included in group exhibitions at ArtWorks Open 2010, Barbican Arts Group Trust in London (selected by Graham Crowley and Timothy Hyman), School of Arts Vol. lll at the HfBK in Dresden, Germany 2013, Anonyme Zeichner, Galerie Nord/Kunstverein Tiergarten, Berlin 2013 and the Contemporary Art Society North, PS Mirabel in Manchester 2013. She curated the group show Resolution at Malgras|Naudet, Manchester, 2014. She was selected for the Saatchi New Sensations exhibition in London 2013 and featured in the best of the year selection of works from Saatchi online.